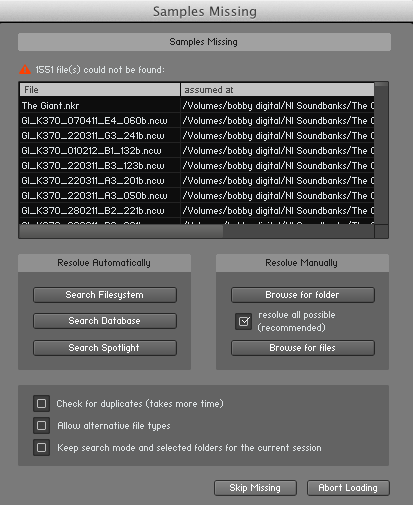 This article explains how to Batch re-save a Library in KONTAKT 5. This function can help if you get a Samples Missing dialog when trying to load an Instrument from a particular KONTAKT Library. This means that the KONTAKT Instrument is unable find its samples. For example, this can happen if you have moved the Library from one computer to another; the file paths of the samples now invalid. Performing a Batch re-save will correct the file paths of the samples for all KONTAKT Instruments within a Library. 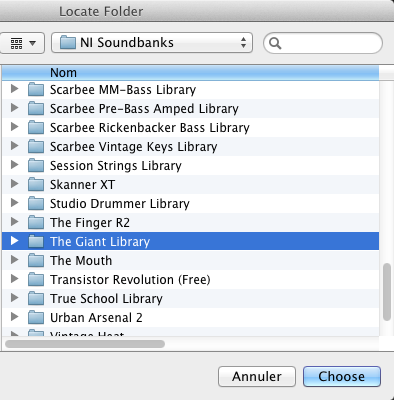 In this example, we try to load The Giant Instrument from THE GIANT Library, but KONTAKT cannot locate the samples corresponding to the Instrument. 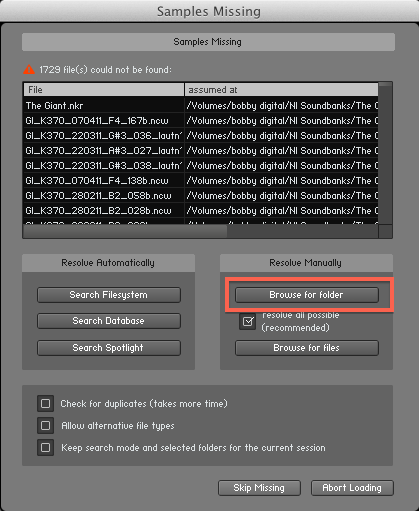 Select Batch re-save from the File drop-down menu within KONTAKT's Main Control Panel. A warning dialog appears. Click Yes to proceed. Locate the Library folder in the OS X Finder or Windows Explorer. In this example, we are selecting The Giant Library. Once selected, click Choose to proceed. At this point, KONTAKT will check the Library. If samples are missing, a Samples Missing dialog will appear. In this dialog, click Browse for folder. 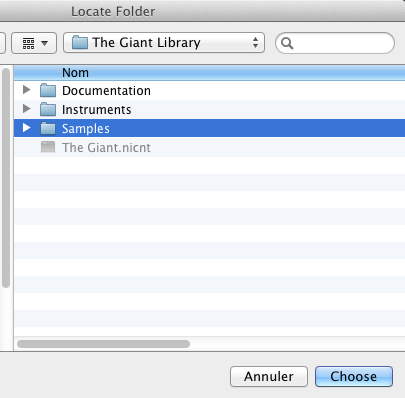 In the Locate Folder window which now appears, select your Library's Samples folder. Once selected, click Choose to proceed. KONTAKT will now batch re-save the Library and re-link all the Library's Instruments to their respective sample content. Your KONTAKT Library's Instruments will now load correctly.